This is the third album from US Doom Metal band Apostle of Solitude. With a quality album cover I was looking forward to hearing this band and they didn’t disappoint. This is Doom Metal with an eye on the past and ambitions on the future. Of Woe and Wounds may have an Old-School core but it has a thoroughly up-to-date production that’s warm and organic whilst simultaneously being punchy and in-your-face. 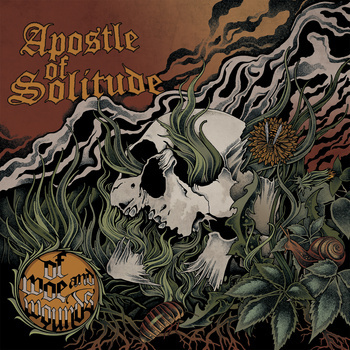 It may be Traditional Doom Metal but the recording leaves no-one in any doubt; Apostle of Solitude are a band that are of the here and now and they mean business. The sound is crisp and crunchy, with the guitars sounding full of vitality and bone-crushing heaviness. Gargantuan riffs rise and fall with the drums sounding immense and the bass being a much more audible rumble than the norm. Of Woe and Wounds combines the classic artefacts of Traditional Doom with elements of the more modern exemplars of the style such as Down and Orange Goblin to result in a truly wonderful album that combines the best of old and new. I even hear strains of Alice in Chains on occasion and it sounds just great, (Lamentations of a Broken Man, for instance). The singer has a powerful voice that rings out strong and clear. He effortlessly becomes the focal centrepiece whenever he’s around. Each song is a first-rate example of Doom Metal and of the depth that it can have. The tracks have a longevity about them that most bands would kill for. Carefully constructed Doomscapes and crawling riffs dominate the proceedings and I couldn’t be happier listening to this. Apostle of Solitude have produced something special here. Make sure you get in on the action. This entry was posted in Doom and tagged Alice in Chains, Apostle of Solitude, Doom, Doom Metal, Down, Metal, Orange Goblin, Traditional Doom, Traditional Doom Metal. Bookmark the permalink.